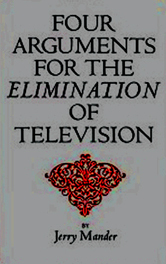 In 1978, Jerry Mander argued for eliminating television, a technology that bred autocracy and was ultimately irreformable. A former advertising executive, Mander maintained that the frenzy of sound and images emanating from the television manipulated viewers, who could never pin down the picture or soundtrack in order to analyze them critically. Mander further argued that television was ultimately boring since it uses only two senses. Thus, in order to counter this banality, programming tended to be highly dramatic, reducing complex issues to simplistic binaries instead of nuanced and sophisticated arguments. And given the representational nature of television programs, which lack materiality, the "picture [was] formed only after it is well inside your brain"(201). In sum, humans were merely victims to the images that washed over them, with no way to "slow the flow" such that, "[i]f you decide to watch television, then there's no choice but to accept the stream of electronic images as it comes" (200). Mander's provocation ultimately hinged on his critique of television's one-to-many format whose effects on human psyches and bodies ran counter to the growth and development of a flourishing democracy. Moreover, he argued, insufficient cross-disciplinary research into the impact of artificial light on the human eye was dangerous since, no doubt, its effect on the body was odious. Several years earlier, in 1972, John Berger was also interrogating television, but through consideration of the genre of oil painting in the European tradition, the institution of art criticism and the ubiquity of advertising in the public sphere. Informed by the work of Walter Benjamin, Berger launched a four-part series on the BBC in which he examined the language of images made possible by color photography and the types of reproduction it spawned. Berger concluded this episode by calling attention to television's limited communicative possibilities. For it to advance, television needed to enable a dialogue. And, of course, in the 1970's, both were correct: programming was ephemeral and generally did not repeat itself and there was no way to view its message more than once. It was time-based with no user controls. Moreover, content was created by a privileged few media makers, while the masses could only consume the sounds and images that were fed to them. Discussion of "The Limits of Television"
Version 1 id 8059 of this page, updated 21 January 2011 by Virginia Kuhn. Created by Virginia Kuhn.